designed to tlickle and delicght your bilingual brain! Compose petite poèmes comprehensible completely both en Français and English! J fool(lement) desire tU . . . J (be)comme Mr. Bean. C’it’s . 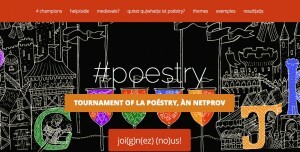 . . Poéstry! Apart(ça) from that, all.tout’s acceptable: cognates, symboles, numb3rs, proper names proprem, etc. Mutuallmently intelligible neologismes sont.are grandly encouragayed. Orthographye & grammaire traditionel be.soit damnayed! The poèmes will communiquate(ront) par.by any moyeans necessaire! C’it’s seulement pfor amusement only! Tweet your poéstry to the hashtag #poestry. We’ll be watching! 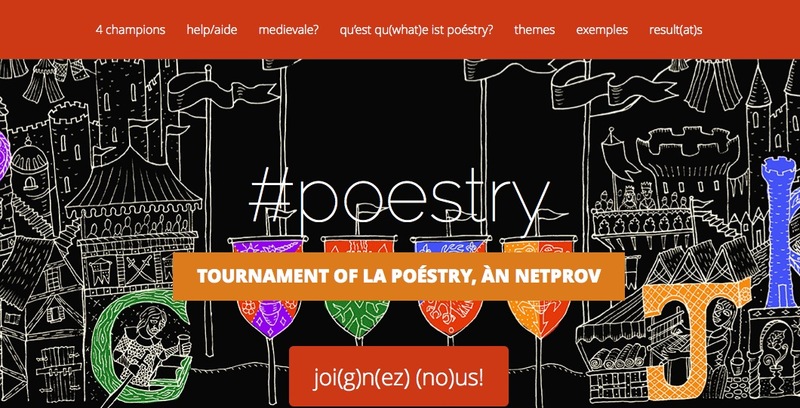 Watch for The Tournament of la Poéstry project in conjunction with Chercher le texte,the conference of the Electronic Literature Organization in Paris, September 23–27, 2103.